Bible Cartoons: 2 Thessalonians goes green! 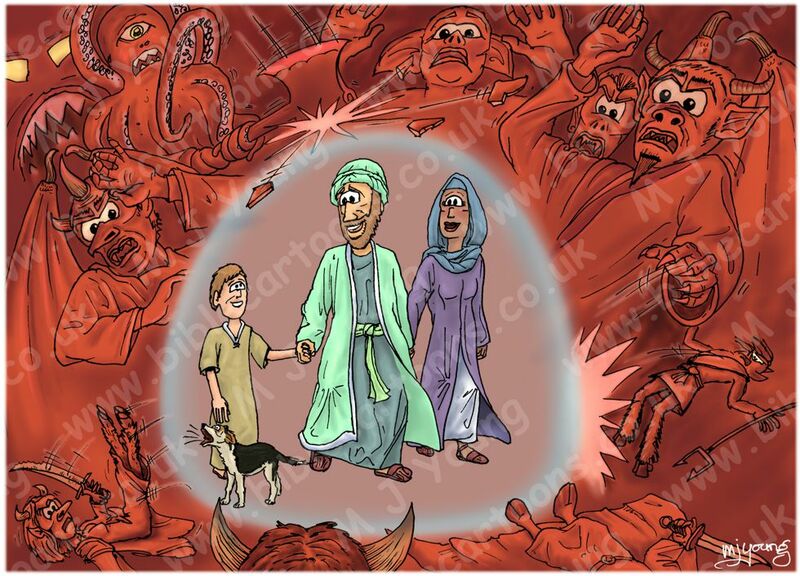 I have just completed my very first Bible Cartoon for the New Testament book 2 Thessalonians – hurray! Once again that means on the Search by Bible Book page, the previously red box (indicating no Bible Cartoons drawn for that book) has now turned green (indicating that a Bible Cartoons HAS been drawn for that book) – yippee! The picture shows a family (husband, wife & child) walking together. Around is a host of daemons all trying to attack them. I decided to draw the daemons in various red tones, I suppose many people think they are red, with horns & hooves – who am I to argue?! The octopus-like one in the top left is different from this stereotype! If you look closely you can see it is wielding an axe, which is breaking on the Godly shield that protects the family, sending shrapnel in all directions! The daemons are bouncing off God’s impenetrable protective shield & falling all over the place!